It was fortunate for Henry V that someone on the Orleanist side of politics decided to murder the Duke of Burgundy. This persuaded the new duke, Philippe the “Good” to take Henry’s side, a development which led to the Treaty of Troyes and Henry’s marriage to fair Catherine of France. Henry had by this time conquered a fair chunk of Normandy, but this had stretched his resources considerably. Thanks to the new alliance he could paint himself as the legitimate ruler of France, and some Frenchmen, like Burgundy, were willing to come over to his side. At the same time, although the cause of the Dauphin and the Orleanists looked bleak, the fact remains that they were in possession of the majority of French territory and the resources that went with it. Henry would need to conquer this, castle by castle, town by town, and every new garrison needed more soldiers and the means to supply them with necessaries. The bright spot was that the conquered territories did provide a source of revenue. The bad news was that the English Parliament was increasingly of the view that the war was “nothing to do with us, guv.” In short, they saw the conquest as Henry’s conquest rather than England’s, and, in their view, it was up to Henry to defeat his “rebels” at the expense of the Kingdom of France. That a typical Englishman of this time had his chest swelled with pride at the thought of English military glory, but at the same moment did not want to pay towards the costs should not really surprise us. It was a characteristic of the English almost all the way through. Henry V’s early death in 1422, with nothing really resolved, was another good example of the “hospital pass”. To Henry V, the glory, to Henry VI the criticism for failing to do the impossible. It was fortunate for the English that the management of their position in France fell to John, Duke of Bedford, Henry V’s next surviving brother, who just happened to be one of the most able men to grace the entire middle ages, let alone the fifteenth century. Bedford won a stunning victory at Verneuil (1424) which was, if anything, more impressive than Agincourt, though rather less famous. After that, though, the Anglo-Burgundian position slowly but surely began to deteriorate. There were a number of reasons for this, and one was certainly that Philippe of Burgundy was never 100% committed, except to his own interests. Another key factor was that French gradually improved their military establishment, not least by investing heavily in artillery. But above all, the limitations of English resources in terms of both men and cash became increasingly apparent as the years went by. As I have remarked before, what is astonishing about Lancastrian France was not that it fell when it did, but that it lasted so long. The Treaty of Arras (1435) detached Burgundy from the English side, and that should have been the end. As it was, the English were not finally expelled from Normandy until 1450, while the last English intervention in Gascony failed in 1453. The tactics of Agincourt no longer worked. The French had developed a well-organised, well-equipped, professional army, while England struggled to raise field armies of any size at all. Much of this prolongation of the war was down to English pluck and determination, to say nothing of good fortification, but it was really a hopeless cause. 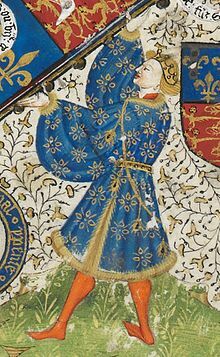 If Henry VI had been a more talented ruler – which would not have been hard – or if some of his generals (notably the first Duke of Somerset) had been a bit more inspired than they were, then maybe, just maybe, the disaster might have been stretched out a little longer. Alternatively, if certain English statesmen – notably Humphrey of Gloucester – had been more realistic and less deluded, then something might have been saved of the English possessions in France. As it was, a losing fight against overwhelming odds could only have one end. The effect on England, as a nation, was disastrous. The self-image of a country that was a great military power was shattered. The treasury was not only empty, but massively in debt, despite years of war taxation. The King’s government was feeble at best, and disorder was commonplace, even to the extent of outbreaks of fighting between rival families. Of course, it must be admitted that Henry VI was one of our least effective monarchs, and that his tendency to favour the incompetent Beauforts over the (relatively) competent Duke of York did not help. The political crisis began long before the final defeat in France, but that defeat added a whole new level to it. Since all attempts at political compromise failed, it was all but inevitable that what we now call the Wars of Roses should break out, even though the first “battle” (St. Albans 1455) was little more than an unseemly squabble. But the root of political instability in England was the disastrous policy of war with France. This song was written in conjunction with the Mortimer History Society for Philip Hume’s book about the noble family. The history of Sandal Castle, and Richard’s place in its past…. Here is an article about Sandal Castle, and Richard’s place in its history. As we mentioned here, Ashdown-Hill’s biography of Richard’s mother was published in April. 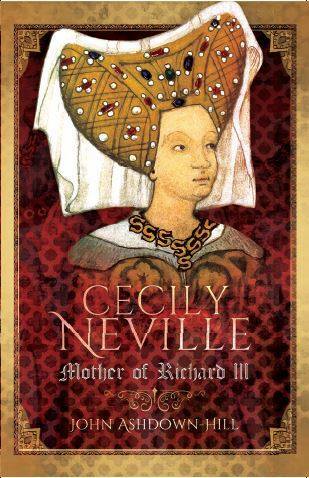 Whils t his latest, to which we shall return later, was released today, we shall concentrate on Cecily here. This is the book that summarises Cecily’s life by delineating her full and half-siblings, demonstrating that portraits (right) previously assumed to be of her and Richard, Duke of York, are of other people. Ashdown-Hill then lists her pregnancies and shows where each of her children were probably born – there is no mention of a Joan but there is further evidence about the birth date of the future Edward IV and Cecily’s ordeals during the first peak of the Roses battles. He deduces how much she knew and how she probably felt about Edward’s bigamy and the Wydevilles, together with the part she played, as a Dowager Duchess, in Richard III’s coronation, but also her years living under Henry VII and a “between the lines” interpretation of her will. 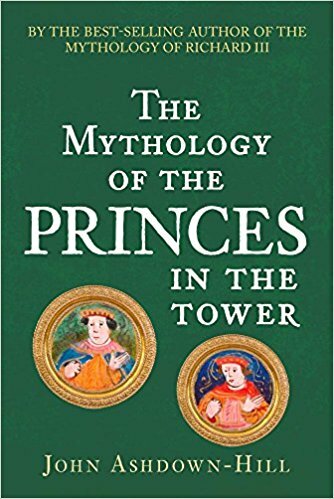 In all, the eighty years of Cecily’s life, survived only by two of her daughters are described in great detail in a book that demonstrates further painstaking research by an author who clearly knows even more about the fifteenth century than he did two years ago. It was not the first time that a Convention Parliament had effectively determined the succession. We might look, for example, the precedent of 1399, when just such an assembly deposed Richard II and (in effect) elected Henry IV, who was not even Richard II’s right heir. (He was the heir male, but strangely enough did not claim on that basis.) Of course, in 1399 Henry’s very large army was in place in the London area, and it would have been difficult for the Parliament to have rejected him, even had it wished to do so. Richard, Duke of Gloucester, had no equivalent army in London when the Three Estates met. It is worth remembering that Parliament could reject claims to the throne it did not care to approve. The obvious example is that of Richard’s own father, Richard, Duke of York, who had his very strong claim rejected in 1460. Peers did not show up at Parliament unattended, and if they had strongly objected to Richard’s claim they could easily have mobilised their forces against him, if necessary. The fact is, they chose not to do so. It seems certain that evidence of Edward IV’s bigamy was presented to the Estates. Sadly, we do not know the details and never will. But it is certain that among the bishops there were no shortage of theologians, any one of whom could have stood up and protested against the accession of Gloucester at very little personal risk to themselves. True, they might conceivably have been imprisoned, but what is that to a senior churchman when the immortal soul is at risk? In 1399, the Bishop of Carlisle objected openly to Richard II’s deposition, and was imprisoned for it, but he survived. There is no evidence of any bishop speaking up for Edward V.
Finally, it is sometimes argued that the legitimacy of Edward V was a matter that ought to have been determined by a Church court. However, the idea that the Parliament of England in the late fifteenth century would allow the succession to be determined by one or more bishops, or even by the Pope, is rather naive. It was, after all, only half a century later that Thomas More and Richard Rich agreed between themselves that Parliament had the power to make Richard Rich king, if it chose to do so. How and why the House of York laid claim to the throne…. Here is an article from English Historical Review, 1st June 1998, telling of how and why Richard, 3rd Duke of York, laid claim to the throne of England. The root cause was an entail to the will of Edward III, who was admittedly in his dotage at the time. The entail, which excluded a female line from ascending the throne, spoils that otherwise excellent king’s legacy as far as I’m concerned. But then, I’m a modern woman who doesn’t hold with the denying of rights simply because the ones being denied are the female of the species! Or the denial of anyone’s true and honest rights, come to that. True and honest being the operative words. The mastermind behind this entail was Edward’s 3rd son, John of Gaunt, Duke of Lancaster, who sought to eliminate any claim from the descendants of his 2nd eldest brother, Lionel. Those descendants were, of course, through the female line, which line happened to be the one from whom Richard, 3rd Duke of York, was descended. Gaunt’s purpose was to see that his own line took precedence. It did in the end, but not in a way old Edward III could have foreseen, and not through the entail. Instead it took the form of Gaunt’s son and heir usurping and murdering his first cousin and rightful king, Richard II, heir of the great Black Prince. 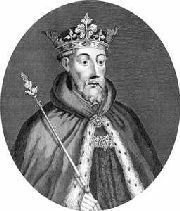 Gaunt’s son took the throne and became Henry IV, the first Lancastrian monarch. So it seems that gallant Gaunt leaned on his dying father to achieve his own ambitious ends. But that’s the House of Lancaster for you! And it was Gaunt’s double-dealing chicanery that eventually led to Richard, 3rd Duke of York, claiming the throne that was his by right. And it all led to what we know as the Wars of the Roses. However, there just might be some doubt about the entail’s existence. According to Penny Lawne’s biography of Joan of Kent: “…In preparation for his [Edward III’s] death he drew up his will, one of the witnesses being Sir Richard Stury, and in an entail specifically designated Richard (II) as his successor…” There is no mention of excluding any female line, but then, Lawne is very pro-Gaunt throughout, so I suppose the nitty-gritty of such an entail was better omitted. Unless, of course, all the entail ever really did was designate Richard of Bordeaux as the old king’s successor. In which case, where did the story of Gaunt’s pressure and interference come from? Ah, well, later in her book, Lawne lays the blame at the feet of Walsingham, who “held Gaunt in particular contempt, convinced he wanted the throne for himself, and repeated virulent gossip and rumours current about the duke…” Walsingham, it seems, even went so far as to portray Gaunt trying to persuade the Commons to discuss the succession, and was so intent upon removing opposition that he requested a law be passed to forbid a woman from inheriting the throne, “which would obviate the claim of Lionel’s daughter Philippa, who arguably held the most legitimate claim to the throne after the prince’s son”. So, this business of excluding females’ claims was due to Gaunt browbeating the Commons, not to Edward III’s entail? Well, not being a fan of John of Gaunt, I am quite prepared to believe he put the screws on his dying father, in order to ensure the House of Lancaster becoming heir to Richard II’s throne, in the event of Richard childless demise. But I can also believe he’d go to work on Parliament. Gaunt was ruthless when it came to furthering his own family, and how better to achieve this than paving the path to the throne? Either way, he tried to see the succession go to the House of Lancaster. Richard, 3rd Duke of York, quite rightly, did not think the House of Lancaster had any business wearing the crown. He was descended from Lionel, Duke of Clarence, and truly believed his (senior) line had precedence. I believe so too. Maybe it was through the female line, but it was perfectly legitimate, and until the demise of Edward III and that pesky entail (or Gaunt’s other forceful activities), there had not been a bar on women taking the throne. Yes, they had to stand back while their brothers took precedence, but if those brothers died, then they themselves had every right to be crowned. Lionel of Clarence only had one child, a daughter. His right passed to her, not to his conniving next brother, Gaunt. Richard of York WAS the rightful king. Now, of course, it has all been changed, and women can take precedence even if they have a younger brother(s). The line goes through age, not gender. And about time too! ANNE MORTIMER AND RICHARD OF CONISBURGH , A LOVE MATCH? 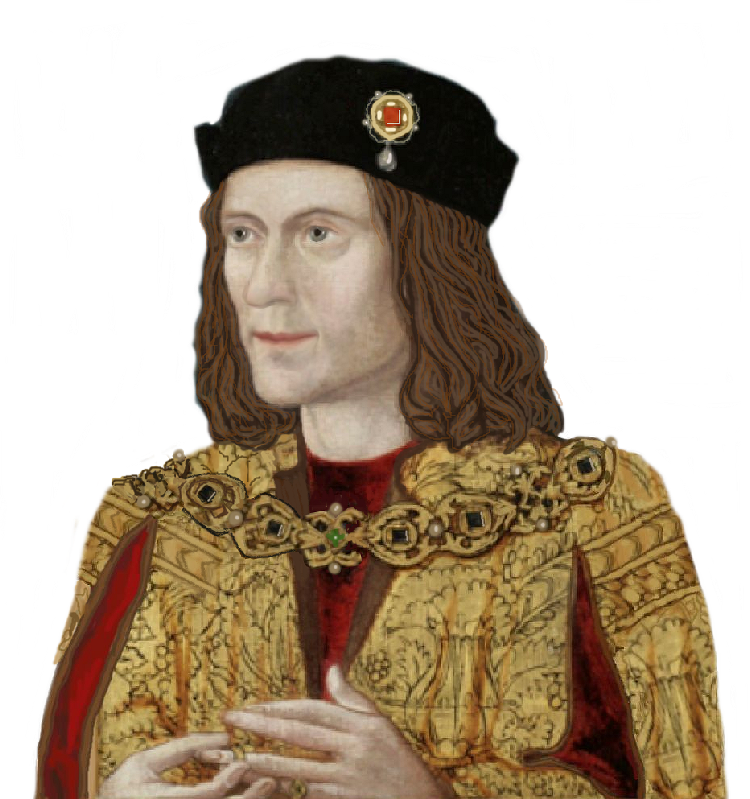 Some time during the month of May 1408 , were married Richard III’s paternal grandparents, Anne Mortimer and Richard of Conisburgh. She was just 16 and he was in his 20s, it being thought that he could have been born circa 1375 but there is some uncertainty about this and it could have been later. It must have been a love match for it was without parental consent but validated by papal dispensation two years later on the 23 May. There was certainly no material gains from the marriage for either of them as Anne and her sister, Eleanor, were both living in straitened circumstances and being described as ‘destitute’ on the death of their mother.. Conisburgh was destined to suffer on going cash flow problems being described at the time as ‘the poorest of all the earls’ and struggling to maintain the lifestyle appropriate for his rank (1) when he was promoted to Earl of Cambridge in 1414. Sadly the marriage was short-lived, Anne dying shortly after giving birth to Richard III’s father, Richard of York on the 22 September 1411 at Conisburgh Castle. The future was to bring about the execution of Conisburgh as a result of the Southampton plot in 1415 leaving their small son an orphan. But I digress , and returning to Anne, it is believed that she was finally reburied once again with her paternal inlaws, Edmund of Langley and Isabella of Castile in All Saints Church, Kings Langley after their original burial place, Convent Chapel, Kings Langley fell into disrepair after the Dissolution of the Monasteries. In 1877, this tomb and its contents were examined by Dr George Rolleston. In a third lead coffin was found the remains of a woman of ‘about’ 30 years old with some of her auburn hair still remaining. These are believed to have been the remains of Anne Mortimer. Some of the remains of Kings Langley Palace, home to Edmund Langley, are thought to have been incorporated in this old farm building. 1) Richard Duke of York, King by Right p35 Matthew Lewis.